I am a creativity coach. I work with people to help them to transform their creative lives. Many people think ‘I am not creative,’ or ‘I am too old/ young/ busy/ to be creative.’ I think that’s a load of nonsense and I will tell you why. I believe that each person that is on the planet is creative. What is that you say? You can’t draw a straight line with a ruler? 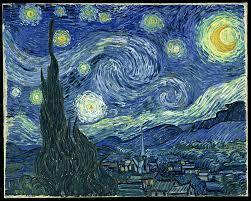 Do you see any straight lines on Van Gogh’s Starry Night? Do you think being able to draw a straight line is some kind of precursor to being a creative? I can tell you that it’s not. Not to say that being creative doesn’t involve some work. You have to decide what to make and how to make it. You have to decide what you want to express. Those decisions can be the hardest part of the work! And, of course the ugly head of fear likes to rear it’s head. Isn’t trying and having an experience that you can learn from worth the risk? I invite you to click here in order to receive my FREE 6 simple steps transform your creative life NOW!